Activist Michael Moore said Democratic establishment types like Nancy Pelosi "use" him when it's to their advantage but otherwise view him as a "threat." In an interview with the Hollywood Reporter, the left-wing filmmaker took shots at Bill Clinton for making the Democratic Party too corporate, as well as the congressional leadership of Pelosi and Senate Minority Leader Chuck Schumer (D., N.Y.). Moore campaigned for Hillary Clinton in 2016 but said he still views himself as an outsider looked at warily by the party's leaders. "They come to me when they can use me, because the people who follow me are just the number of votes that they need to get put over the top," he said. "But otherwise—Nancy Pelosi and the party infrastructure, they see me as a huge threat." As an example, shortly after the 2004 election where President George W. Bush was re-elected, Moore said he helped convince Al Franken to run for the U.S. Senate in Minnesota. Franken eventually agreed and wanted Moore to help him raise funds, but he told him he couldn't directly accept Moore's money because it "wouldn't look good." Moore is set to debut his latest attack-dog documentary, called Fahrenheit 11/9, . The title is both a reference to his 2004 film Fahrenheit 9/11, which eviscerated the Bush administration, and is the date of when Trump's election victory was officially called, November 9, 2016. The movie starts with Trump's election but then delves into the wider resistance movements across the United states, such as the gun control activists led by high-schoolers in Parkland, Florida. 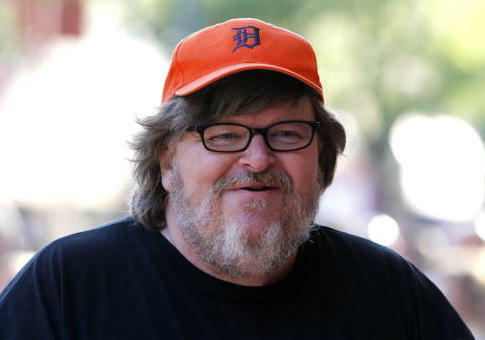 "If people think this is Michael Moore's Trump film and that they're going to get two hours of Trump, Trump, Trump, I'm sorry but I'm not going to give you a simplistic film like that," Moore said. "Yes, I will show you some stuff about Trump that you haven't seen, but if you're coming to see the pee tape, you're going to the wrong movie." Moore predicted Trump's victory the summer before it occurred, warning the audience of Real Time with Bill Maher that Trump could win rust-belt states like Michigan, Pennsylvania, Ohio, and Wisconsin. The audience booed, but Moore was proven right. This entry was posted in Politics and tagged Michael Moore, Nancy Pelosi. Bookmark the permalink.